The Junior Finals had two components: one in the afternoon, and another in the evening. 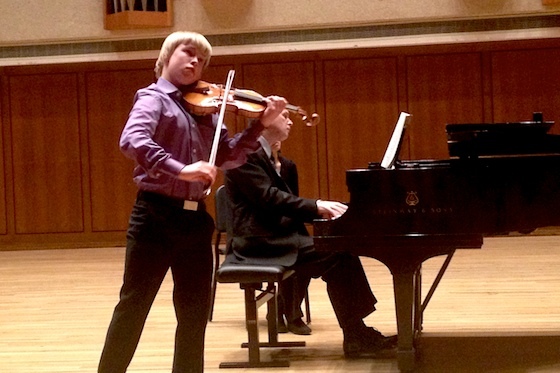 Overall, the varied repertoire and requirements allowed for each young violinist to showcase a wide range of capabilities. During the afternoon, each competitor was required to play the first movement from a specified Beethoven, Schubert or Brahms Sonata. 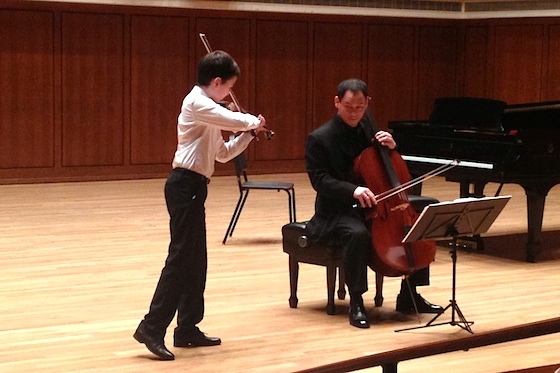 Also, each performed the Handel-Halvorsen "Passacaglia," with cellist Bion Tsang. Incidentally, Bion Tsang should also receive an award for giving seven performances of this not-exactly-easy-to-play duet all in one afternoon, and with kids who had the chops to ride the piece like a speed demon. He did it with sensitivity and fantastic technique, all with a supportive smile and reassuring demeanor for each contestant. Playing Beethoven sonatas allowed the young artists to show how cleanly they could play and how well they could interact with piano in these rather pianistic works, which don't leave any room for even a little sloppiness. Some highlights: Alex Zhou began Beethoven Sonata No. 5 Op. 24 with an outpouring of warm tone and played with maturity and assurance, as well as many degrees of piano and forte. His Handel-Halvorsen was rhythmically clear, with ringing and accurate pizzicato and an exciting accelerando at the end of the movement. Daniel Lozakovitj immediately grabbed me by the ear with his beautiful vibrato in his Beethoven No. 5, Op. 24. When it was over, he hugged the pianist. He seemed to have a friendly and deferential personality that also showed in his playing; during the Handel-Halvorsen he seemed to be making such a sincere effort to enter into a true musical conversation with the cellist that he actually stepped in his direction, inching his way toward the cellist throughout the piece. When it was over, he insisted that Bion Tsang accompany him for the curtain call. In his Handel-Halvorsen, Rennosuke Fukuda had us captivated during the slow and chordal variation. In this picture he is playing Beethoven Sonata No. 1 Op. 12. Elvina Sung-Eun Auh played an elegant and thoughtful Sonata No 8, Op. 30. Ludvig Gudim was the only one to play Brahms Sonata in G, which he did from memory and with an exciting ending. In the evening was a concert at Bates Hall -- which was filled to capacity with audience members of all ages -- in which each contestant played a showpiece with the University of Texas Orchestra, with Gerhardt Zimmermann conducting. Four of the violinists played Waxman's "Carmen Fantasy," and three played Sarasate's "Zigeunerweisen" -- none of the competitors had chosen the other two options, which were Wieniawski's "Polonaise Brillante" and Saint-Saëns' "Introduction and Rondo Capriccioso." It did seem a little unbalanced to put the extraordinarily technically difficult Waxman up against the less-difficult Sarasate! Ilana Zaks opened the evening with the "Carmen Fantasy," for which she wore a red dress. In fact, there was a lot of red concert wear in honor of the fiery and sensual Carmen! Ilana seemed to thrive on the energy she was getting from the orchestra, and her excellent performance was met with enthusiastic applause. Alex Zhou played Zigeunerweisen with incredibly good sound -- his fast clip proved just a bit faster than the orchestra's at the end! 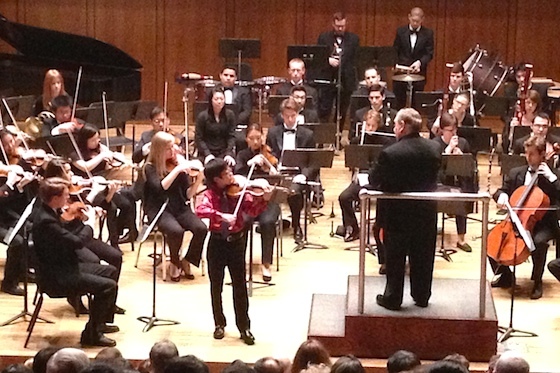 Playing "Carmen Fantasy," Rennosuki Fukuda was simply astonishing. Toward the beginning of the piece, he seemed to be fitting himself in with the orchestra; then he simply took over the reins and everything flowed from him, from then on. He knew when to hold a moment, or when to let a double-stop run flow like water. It was very articulate -- notes that don't usually come to the surface in this densely-notated piece rang out clear. There was no chance this thing was going to unravel during the swirling tornado of notes at the end; he just stood steady and victorious. And yet there was more excellence to come. Daniel Lozakovitz played the introduction of Zigeunerweisen with his heart-breaker vibrato and kept the tension going. The beginning of this piece is full of stops and starts and it can get, let's say it, boring. Not so with Daniel. He can string the audience along, make it feel like he's just about to tell us the punchline, but no, he keeps dodging it, keeps playing peekaboo. As he did with the cellist, Daniel insisted that the conductor stand with him to take the curtain calls. Elvina Auh's "Carmen Fantasy" would have earned her accolades in any other company; on this night it was a little ragged next to the extraordinary accomplishments of her peers at this competition. Ludwig Gudim played Zigeunerwiesen with a generous amount of wide and fast vibrato. He has a special kind of presence on stage, moving a great deal with the music. Jaewon Wee gave the "Carmen Fantasy" a nice, dancing feel, with lilt and bounce where needed. The considerable tricks that Waxman requires were precise and audible, and the very complicated finale of the piece was riveting. As jury member Pamela Frank said when announcing the prize winners: the accomplishments of these bright and promising young artists bode well for the future of our art. For a list of the prize winners in the finals, please see this page. I remember Ilana Zaks from our Arlington Philharmonic Family Concert 2 years ago. She was the under-18 winner of the Young Artist Competition and she played the Saint-Saens Introduction and Rondo Capriccioso and an encore, Ravel's Tzigane. 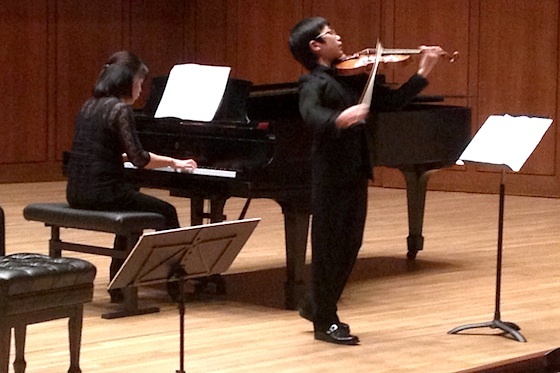 Now she's in the Menuhin competition. Wow! It was clear back then that she was really going places, and she has. She turned 12 right before the concert at the end of February 2012, so she must have just turned 14 at the competition here.